Guerrero didn't garner much notice when drafted in the 15th round in 2012, and posting decent but unspectacular numbers in Bristol for two seasons (as he struggled with some mild shoulder issues). But 2014 was a breakout year for the lefty, as he posted a strong 9.2 K/9 against a good 3.1 BB/9 in Kannapolis in his age 19/20 season. He started nine of his 27 games but was part of a tandem rotation with fellow lefty Andre Wheeler. While he only threw 78 innings, that's more than triple his total from the previous year. 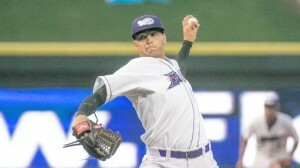 In 2015, Guerrero was dominant in 9 starts with Kannapolis (2.28 ERA, 0.94 WHIP, 6.8 H/9, 1.6 BB/9, 9.8 K/9) and promoted to Winston-Salem, where he also did quite well in 16 more starts (3.94 ERA, 1.10 WHIP, 7.9 H/9, 2.0 BB/9, 8.5 K/9) while playing a couple years younger than the league-average player. But 2016 was a challenge for Guerrero with an aggressive assignment to AA as a 22-year old. He finished with a 4.83 ERA, but his strikeout rate dropped to 7.1 and his walk rate ballooned to 4.8. As predictable as his 2016 wall-bang was due to massive innings increases, his bounceback in 2017 was equally easy to see coming. Repeating AA, he dropped his ERA by 0.70, decreased his walks to 2.6/9 and upped the K's to 8.4/9. A bit of a surprise not being added to the 40-man roster in December, Guerrero survived the Rule 5. 2018 has been a strange year for the lefty. He opened back in AA, saw his peripherals improved but got hit much harder, and was promoted to AAA Charlotte anyway in June where the hits have gone down but the walk rates spiked. Jordan struggled through some shoulder issues early in his pro career. Having built up strength, his fastball now typically runs 90-93 (had been lower prior to 2015) with some sink. He throws a change-up that has been described as above average or plus, and has a developing curveball that scouts feel could be a reliable out pitch with more development but it hasn't quite gotten there yet. Command has been strong in some looks and less so in others. He's got a good pitcher's frame and maintains velocity through his starts now that he is at full load. Another factor in the 2017 bounce-back was getting away from the cutter entirely, and adding back a slider that is now a regular part of his mix. His stuff doesn't profile for LOOGY work. Going into his age 24/25 season and technically his 6th year as a pro, Jordan needs his fastball and/or a breaking pitch to improve noticeably to get his shot.